The 1999 Mustang GT came with 16 inch cast aluminum wheels, lower valance integrated fog lamps, single rear wing spoiler, racing cloth front bucket seats, leather wrapped steering wheel, optional upgraded rear axle, and optional Mach 460 sound system following the GT options offered in 1998; but received the more powerful 260hp 4.6L SOHC V8 engine. Dark Satin Green 1999 Mustang GT coupe owned by Jean-Francois Barrette from Quebec, QC, Canada. This is one of two greens offered in 1999 on the Mustang. The other is a lighter green called Electric Green. This is more of a gray green. Jean-Francois tells us, "Last summer, I had a 1999 Laser Red V6 convertible, and a friend want to buy it so I sold it and bought my 1999 Dark Green Satin hard top with only 35000km." Rio Red 1999 Mustang GT with a 260hp (281ci, 4.6 liter) electronic fuel injected, single overhead cam, V8 engine, GT recessed hood scoop, and GT rear spoiler. This is a Limited Edition 35th Anniversary 1999 Mustang GT coupe. Ford only produced 4,628 of these Limited Edition 35th Anniversary GTs in 1999. 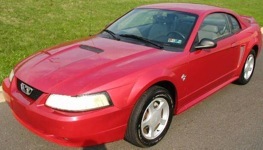 This car was given features of the 2000 Mustang GT - such as the raised hood scoop, side scoops and raised spoiler. You could only get this Limited Edition car in red, black, silver, or white. Crystal White 1999 Mustang GT 35th Anniversary Limited Edition convertible at the 2010 Mustang car show in Port Angeles, Washington. 4,628 of these Limited Edition 35th Anniversary GTs were built in 1999. Unique options included a raised hood scoop, side scoops and raised spoiler. It only came in red, black, silver, or white.